So was it a great conference or only a good one? We do have the 2008 Columbus Conference (the last one held in America) to compare to, and there were some problems with this conference that did not occur in 2008. Probably the single biggest complaint by the attendees was the extremely full schedule each day, with 20 papers delivered on Friday and 17 on Saturday. This left virtually no time between presentations for any discussions or questions from the other attendees. In Ohio in 2008, fewer papers were presented and consequently, a Q & A session was scheduled once or twice during each day of the conference. In St. Louis, only one such session was scheduled for the entire event, on Saturday evening, and it did not begin until about 9:00 p.m. Considering that the presentations started that morning at 8:00 a.m. and only one hour each was allocated for lunch and dinner, the audience had already spent about 10 hours in the room that day before the Discussion Session even began! In spite of all that, thanks to the true dedication of the attendees, it was still one of the highlights of the entire conference. In all fairness, I was not on the organizing committee that reviewed and selected the papers and not party to their decisions, but I am sure they simply wanted to include as many of the papers submitted to them as possible. Unfortunately, that made for some frustrating moments and a rather tiring event, but one that was certainly well worth the effort. To help mitigate the lack of discussion issue and address some of the criticisms that came afterwards, the organizers promptly added an interactive Discussion Forum page to their website where questions or comments could be posted and discussed with conference authors. Under the circumstances, I believe that was an excellent solution. I was trying to wake up during breakfast on Sunday morning after only five hours of sleep, when I overheard the following remark from a nearby table: “I am suffering from an overdose of neutron radiation!” I actually laughed out loud and immediately wrote it down so I could remember it and share it here with you! This was obviously a tongue-in-cheek commentary on the large number of radiation related papers that had been presented at the conference over the previous two days. I thought it was a brilliant remark (or at least it seemed brilliant at 7:30 a.m.)! [There was] a presentation on another radiation theory of image formation from Robert Rucker, in this case, claiming neutron radiation released from Jesus’ body during the Resurrection created the image. Naturally, this was well received by some in the audience, but not by everyone. It was a bit too neutrony for my taste. But do read Barrie’s Personal Report on the Conference. There was much more to the conference. It’s usually considered a privilege to have one’s paper accepted onto a conference program(me), and a right for the attendees to address questions to speakers immediately after each presentation. Everything got turned on its head at St.Louis: it was a privilege for attendees to listen to the speakers, and the speakers’ right not to be asked questions. I’m glad I stayed at home (which also helped reduce exposure to those neutrons). Barrie…….As usual, we in the Shroud crowd owe you a debt of gratitude for all the time you put in managing shroud.com, as well as the enormous contributions you continually make in the world of sindonology. 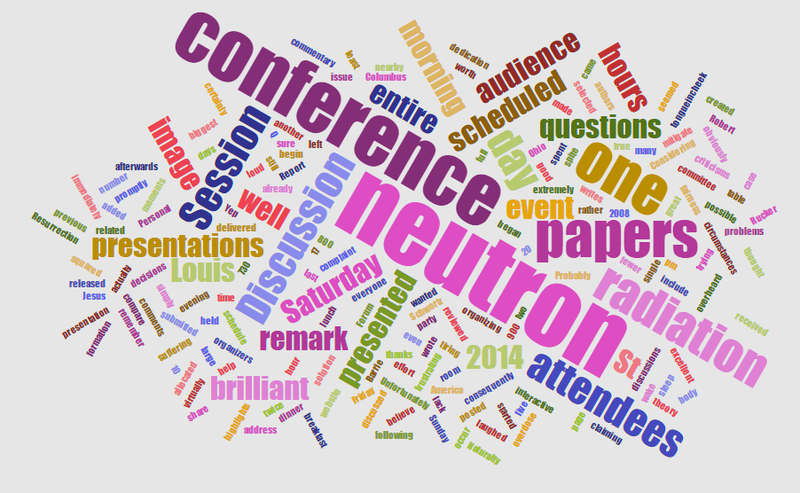 A Personal Report on the 2014 St. Louis Conference being just one of them. Thanks! The congruence reported in the location of calcium deposits found in the sudarium of Oviedo and the shroud seems, to me, more interesting than the neutron madness. Particularly when noting the gap between the reported C14 dates (8th vs. 14th centuries). Barry Schwortz’s report on the 2014 Shroud conference in St. Louise was quoted above as saying “[There was] a presentation on another radiation theory of image formation from Robert Rucker, in this case, claiming neutron radiation released from Jesus’ body during the Resurrection created the image. Naturally, this was well received by some in the audience, but not by everyone.” Unfortunately, this statement in Barrie’s report was in error. I used the MCNP nuclear analysis computer code to determine the effect of neutrons released from Jesus’ body on the C-14 dating of the Shroud of Turin and the Sudarium of Oviedo, but I said nothing about the neutrons creating the image. In fact, I strongly believe that neutrons had nothing to do with formation of the image. I have discussed this with Barrie, and he has now corrected his statement. My presentation was titled “MCNP Analysis of Neutrons Released from Jesus’ Body in the Resurrection.” Both my PowerPoint slides and my narration to them area available at shroud.com or can be located by doing a Google search on the title. And I have just posted an email from Robert with the links. See Another Reaction to Ray Rogers’ Paper on Radiation. Thanks, Bob, you can now post without having to wait for moderation.